Former Chester inside forward Mike Metcalf has sadly passed away at the age of 79 after a long illness. Mike was an integral part of the “Famous Five” forward line, alongside Gary Talbot, Elfed Morris, Jimmy Humes and Hugh Ryden, that each scored more than 20 goals in all competitions in the 1964/65 season. He was the overall leading scorer in that campaign with 37 English league and cup goals and in a Sealand Road career that extended from 1963 to 1969 he scored 68 goals in 221 Football League games. Mike started his career as a junior with Everton and joined Wrexham in May 1957 as a part time professional which allowed him to complete a degree course in chemistry. He made his first appearance for Wrexham against Hartlepools in 1957 and in a 6 year career at the Racecourse Ground scored 58 goals in 121 league appearances. Although born in Liverpool he was brought up in Saltney and as a Chester supporter Mike leapt at the opportunity to cross the border in December 1963 for what was then a record fee of £5,000 and made his debut in a 2-1 win over Workington. A skilful ball player with a natural ability to find the back of the net Mike quickly settled into life at Sealand Road and his dynamic performances were a key feature in one of the most exciting teams in the club's history. During the 1964/65 season Chester reached the 3rd Round of the FA Cup where they were narrowly defeated 2-1 at Old Trafford by Manchester United. Mike contributed five goals in that run, including a hat-trick in a 5-2 win at Barnsley, and his overall total of eight goals in the competition is a club record he jointly holds with Foster Hedley. He also scored twice in arguably the most exciting game ever seen at Sealand Road when Chester came from behind three times to beat Second Division Derby County 5-4 in a League Cup tie. His man of the match performance that evening prompted the visitors to offer £30,000 for his services after the game. Between October 1964 and September 1967 Mike created another club record by starting 127 consecutive league fixtures, a record that was only broken by John Danby in 2009. In 1968 Mike began to look at a career outside football and having obtained a degree in chemistry and maths he took the opportunity of studying on a teaching course. 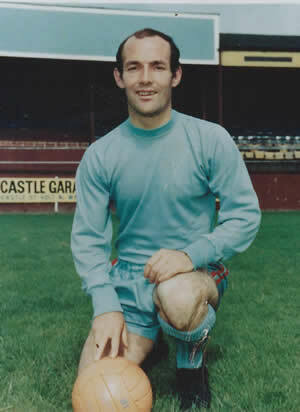 However this meant going part time and so at the start of 1969 he dropped out of league football and joined Altrincham. After a season at Moss Lane he had a short spell at Bangor City before joining Rhyl. While Mike was at Rhyl the Welsh club reached the 3rd round of the FA Cup and he scored the equalising goal against Chester in a Welsh Cup 5th Round game at Sealand Road in 1972. After leaving Rhyl Mike had a short spell as manager of Connah's Quay Nomads followed by a similar position at Witton Albion but the job of player manager proved to be too time consuming and in the mid 1970s he left Witton to concentrate on his job running his own business selling laboratory equipment and chemicals to industry, colleges and hospitals. A resident of Connah's Quay Mike was a proud member of the Blues' Hall of Fame and an active member of the Chester Former Players Association and will be sorely missed by everyone. Our condolences go to his family and friends.